Douglas W. Fuerstenau Professor Kellar; Professors Cross and Salem; Associate Professors Crawford, West, and Widener; Assistant Professors Jasthi and Safarzadeh; Research Scientist Meruga; Adjunct Professors Bendler, Kustas, and Medlin; Distinguished Professor Emeritus Han; Professor Emeriti Howard and Stone. Materials and metallurgical engineering is the branch of engineering that develops and supplies the materials for virtually every other engineering field. Three-fourths of all elements are metals, so metals play a vital role in nearly every aspect of modern life. Metallurgical engineers transform the Earth’s mineral resources into finished products by extracting metals from ores, producing ceramics from metal compounds, and fabricating composite structures. Modern materials are exotic and so are the methods of producing them. Metallurgy is based upon the principles of chemistry, physics, and mathematics. These sciences provide an understanding of the methods of metal production processes and the behavior of materials. In addition to familiar materials such as steel, aluminum, copper, glass, gold, and silver, metallurgical engineers produce many exotic materials such as metals with shape memories, ultrahigh-purity materials for integrated circuits, materials for surgical implants, ceramics for space vehicles, nano-scale metal particles and superconductors. There are three areas of specialization in metallurgical engineering: mineral processing, extractive metallurgy, and materials engineering. Mineral processors concentrate ores and recycled materials so that extractive metallurgists can produce pure, high-quality metals and non-metallics for use by materials engineers who transform these materials into the marvels of our advanced civilization, ranging from space craft to thin diamond films. Metallurgical engineers are actively involved in nanotechnology and the production and utilization of nano-scale materials. Advances made by metallurgical and material engineers make advances possible in other engineering fields. This happens because virtually every engineering field is in constant search of higher-performing materials. Metallurgical engineers are responsible for the production of materials and also for the evaluation of metals, ceramics, and polymer-based composites. The evaluation of materials includes tests to determine strength, hardness, toughness, corrosion behavior, and many other properties. It is the role of metallurgical engineers to develop processing methods to create materials with specific and exacting properties for every conceivable application. The primary source for materials continues to be extracted as ores and petroleum from the Earth. However, recycled materials are an increasingly important material source for metallurgical engineers. 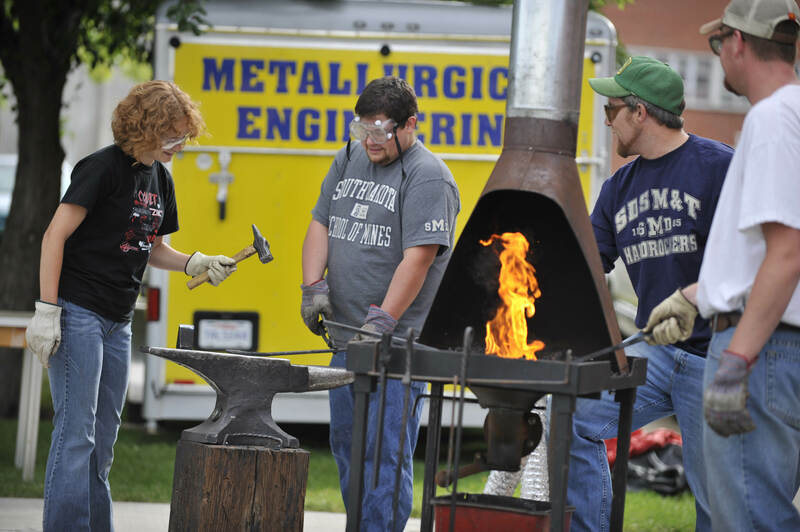 Materials and metallurgical engineers are employed throughout the nation and the world. The Bachelor of Science Degree in Metallurgical Engineering is accredited by the Engineering Accreditation Commission of ABET, http://www.abet.org, 415 North Charles Street, Baltimore, MD 21201; Phone +1.410.347.7700. Successfully apply metallurgical engineering principles in their employment. Meet societal needs through science and technology. Serve their profession and community. The courses on the checklist correspond with the first semester of junior year beginning in an EVEN-numbered year. Course offering cycle information for Sets A, B, C, and D are provided in Curriculum Notes. The courses on the checklist correspond with the first semester of senior year beginning in an ODD-numbered year. Course offering cycle information for Sets A, B, C, and D are provided in Curriculum Notes.